WASHINGTON (Reuters) - U.S. Army paratroopers began military training for small units of the Ukrainian national guard on Monday despite Russian warnings that the action could destabilize the country's tenuous cease-fire. 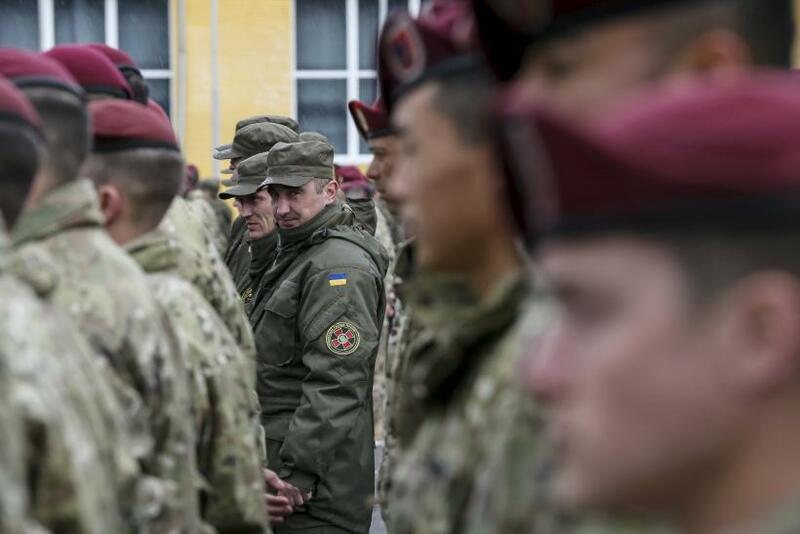 Army Colonel Steve Warren, a Pentagon spokesman, said 300 members of the Army's 173rd Airborne Brigade based in Vicenza, Italy, began long-planned training for about 300 Ukrainians at the International Peacekeeping and Security Center at Yavoriv in western Ukraine near the Polish border. The unit is expected to train a total of 900 guardsmen in three rotations over six months, Warren said. He said the training included everything from medical care and casualty evacuation to how to shoot and move as part of a small military unit. Warren rejected Russia's suggestions the U.S. action was destabilizing. "I would say it's Russia that is destabilizing Ukraine," Warren said. "They are the ones who are continuing to supply lethal weapons. They are continuing to send Russian forces, combat forces, into Ukraine." Last Thursday, Russian President Vladimir Putin again denied Western allegations that Moscow provides separatists with soldiers and weapons. Russia seized Crimea from Ukraine in March 2014 after street protests toppled a Moscow-allied Ukrainian president in Kiev who had scrapped a deal to move closer to the European Union. Separatist fighting then spread to Russian-speaking regions of eastern Ukraine, where clashes between pro-Russian rebels and Ukrainian forces have killed about 6,000 people. Ukraine and the United States have accused Russia of interfering in the conflict, but Moscow charges that Washington's efforts to bring Kiev closer to the West were responsible for the violence. The United States said it delayed the training mission for several weeks to avoid increasing tensions as a ceasefire went into effect. While the cease-fire has held, violence and violations are reported almost daily. Kremlin spokesman Dmitry Peskov told reporters in Moscow last week that the "participation of instructors or specialists from third countries on Ukrainian territory, where the domestic Ukrainian conflict is unresolved ... could destabilize the situation." Pentagon spokesman Warren played down those concerns. He said the mission was suitable for national guardsmen and included defensive and civil-military operations such as countering improvised explosive devices. He said the training was taking place in the far west of Ukraine and there was not believed to be "any real danger at all to American troops that are on the ground."